With its growing number of daytime fun sing-along sessions, the Goldies Cymru Charity is taking off across South and West Wales. Fondly referred to simply as ‘Goldies’, the growth of the charity has been supported by the Cardiff-based Moondance Foundation and the Big Lottery Fund in Wales. 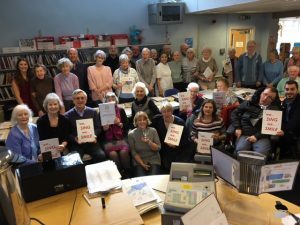 The charity Golden-Oldies started life 10 years ago in the West of England, with Goldies Cymru starting in and around Cardiff four years later. There are now 12 freelance session leaders in Wales with sessions that take place at libraries, memory clinics, dementia care homes, ageing well groups, day centres and in partnership with Cardiff Institute for the Blind, Multiple Sclerosis groups and in hospitals. “Our charity reaches out to older people, many who live in isolation and have little in their lives to look forward to. We are certainly NOT a choir but fun singing of the popular songs of the 60s and onwards are at the heart of all that we do. Hardly a day goes by without a request to introduce our charity in a new area and with the support of our two wonderful supporters, Moondance Foundation and the Big Lottery Fund in Wales, we will have at least 100 sessions by early 2019. The work of the charity has been recognised through a number of awards. Earlier this year Goldies Cymru was the national 2017 Epic Award winner run by the Voluntary Arts organisation. Goldies was shortlisted for this major award from a short list of 32 groups. Recent developments have seen more Goldies daytime sessions being introduced across library hubs and our photograph shows a packed Rhydypennau Library with session leader Sue Thomas.